On September 20th, the school board approved a very new set of goals. You’ll be surprised how different they are. A few of the new goals are laudable, a few others sadly disappointing. Here are last year’s goals. Immediately below these you will find this year’s goals. I’ll help with the edubabble. 1) Goal #1: “Standards and Assessment Understanding.” From listening to the Sept. 6th TRSB meeting, by “Standards” this seems to refer to standards relative to curriculum. “Assessment” relates to reviewing various test scores for students as they progress through the year. This sounds promising so long as the board keeps squarely focused on adjusting standards to meet the Common Core Standards and keeping tabs on student assessment results to judge the effectiveness of instruction. I worry that this exercise might turn into a blame the standards and/or assessment exercise. Educationists have been known to quickly turn from looking to improve outcomes to gaming the assessment. Despite being less than clear, this goal seems, for the moment, a good start at trying to improve educational outcomes. 2) Goal #2: “Integrate family, school and community into the district wide strategy for student success.” Hmm… Somehow in the past, kids got educated without parents being ‘engaged’ with schools, and the community knitting them sweaters by candlelit vigil. The community is as engaged as it needs to be. Sandown residents give 66.55% of their property taxes to support education. Any more support and our selectmen would be serving lunch in the schools’ cafeterias. Calling on three generations of family and the fire department to educate a child is nothing less than an abdication of duty disguised as sociological enlightenment. There is a self-serving condescension going on in education today that thinks that kids with busy, or even neglectful parents and kids from economically disadvantaged backgrounds cannot be effectively educated. Educational statistics broken down by race and income are an insult to every kid and nothing but a crutch on which teachers and school districts can hang their failings. Have some respect for your charges, please. Let the firemen do what they do best and don’t expect parents to be any more than supportive. 3) Goal #3: Capital Improvement Plan. Good. Let’s hope for no emphasis on ‘bond ready’ anything. 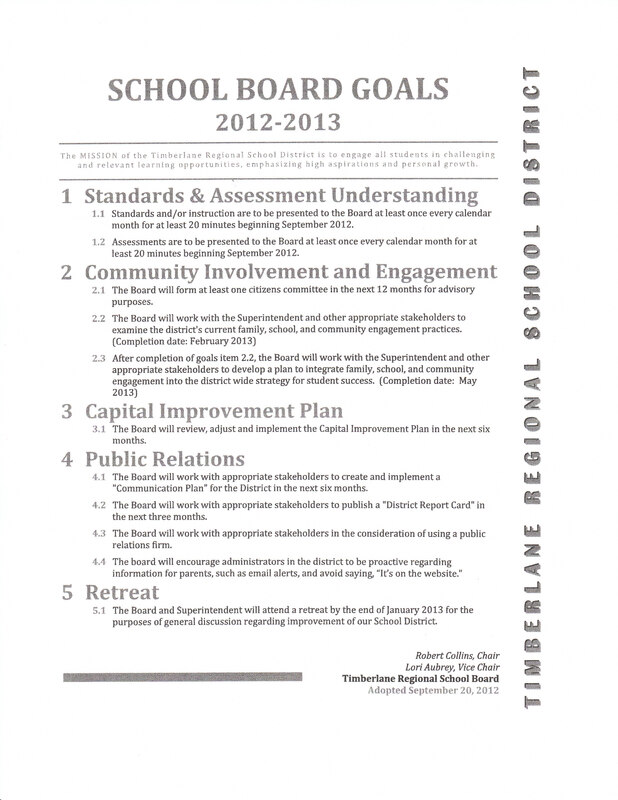 4) Goal #4: “Public Relations” The board will publish a district report card within the next three months. That’s good, but I’ve just published one a few days ago as it happens. (See blog entry “Do more teachers = better results?” ) The district’s results do indeed need a PR firm so you don’t stage a property tax revolt. I welcome a truthful district report card and hope the board will produce one, but I strenuously object to my tax money paying a PR firm to tell us that while our high school kids are behind the national average in SATs, really everything is hunky dory. 5) Goal #5: “Retreat” By Sandown’s standards, the SAU boardroom is itself a retreat of spa-like luxuriousness. At first I was gasping for air in sheer incredulity at the suggestion of a retreat. Turns out from listening to the September 6th recording, that the “retreat” is a long, untelevised brainstorming session open to the public. It was proposed as a non-travelling retreat by Mr. Barczak, but the “non-travelling” descriptor was left out leaving me to wonder if the location of this session is still to be determined. Thus we come to the school board’s prickly relationship with transparency. On Sept. 20, 2012, the board voted with just one opposition, (thank you, Mr. Barczak), to condense meeting minutes drastically and in place of a written account of discussion to insert in the minutes timetags referring to the video recording. The chairman said the aim of written minutes would then be to provide a “framework without specificity.” You see, so eager is the board to embrace and engage time-starved parents and the community, that it now requires them to go to the video, hours long and minutes to download, in order to find salient information. If you think this is a step forward in transparency, I have some windows with condensation between the panes to sell you. Also on Sept. 20, the board voted to have a trial school board meeting at a school instead of at the SAU building. (Ms. Steenson vigorously objected. Thank you!) This was suggested by Mr. Bealo as a community outreach initiative, but the board seriously underestimates the consequences of technical difficulties at remote meetings. Live TV broadcast will not be available and audio capture will be challenging. Sandown residents who have long struggled to hear town meetings on their TV’s full volume, will have good reason to be skeptical of the soundness of this new arrangement should it pass trial. Oh, and did I mention these recordings are now part of the official minutes? This post was written on Sept 30, 2012 8:00 pm. As of this time the Sept. 20th meeting minutes were not posted online. I understand school board meeting minutes are not posted online until they have been accepted though there is no reason draft minutes should not be online since they are legally required to be public. You can speak of engagement and outreach all you want but when you fall down on basic transparency there’s little trust on which to build. Credit: TRSB’s new goals were brought to my attention by a friendly parent. Thank you. Do more teachers = better results? 4 years as SINI in reading. This is even worse than may appear because, as the DOE site says, “To be designated as a school in need of improvement, a school must miss AYP for two consecutive years in the same content area(s). ” (Schools must also meet AYP for two consecutive years before being removed from SINI.) Five out of seven of the schools in our district are designated Schools in Need of Improvement by the federal government. Only Sandown’s two elementary schools are showing adequate yearly progress. Sadly, these students lose their advantage when they move on. At the risk of flogging a dead horse, I’d like to point out that our previous superintendent was the fifth highest paid superintendent in the state in 2011-2012. Our current Assistant Superintendent is the fourth highest paid in the state. http://www.education.nh.gov/data/documents/salaries11-12.pdf Another example again that money does not buy academic excellence. We all must hope that Dr. Metzler can turn things around and hold the school board to this expectation. As promised, here is a quick summary of staffing to total student population in the Timberlane district for the last seven years. (I had promised ten, but online records go back only to the 2004 annual report.) You can see a steady decline in total enrollment since fall 2007. Teacher/student ratios are also changing. In 2004-2005 we had one teacher to 12 students and one assistant to 24 students. In 2010-2011, there is one teacher to 10.5 students and one assistant for every 22.5 students. These figures were a little challenging to obtain as the annual reports sometimes show staffing for one academic year while giving enrollment figures for another academic year. This required me to refer to two successive annual reports to get the information for one academic year. The staffing numbers for 2011-2012 should be in the 2012 annual report when that is released. Update: A quick check with the Department of Education website shows TRSD at 3843 students with 309 teachers for a student/teacher ratio of 12.4 as of October 2011. These figures exclude pre-school and kindergarten enrollment and teachers. Not sure why there should be a difference of 99 teachers between annual report figures and the state figures as the total teacher count did not jump much when kindergarten was introduced. Can anyone shed some light on this? The district’s annual facilities tour, which included the Budget Committee, began on September 13 with tours of Timberlane Regional Middle School, Timberlane Performing Arts Center, and Timberlane Regional High School. The facilities were, with just two exceptions, in excellent repair and so spotless the tour goers applauded the maintenance staff. Floors gleamed, walls were without mars, windows and doors shone and nothing I saw looked abused. The facilities projected pride, self-respect and solid maintenance. Now for the exceptions. The PAC’s facade is in need of attention due to a design flaw with rain discharge that causes freeze cracking. Additionally, inappropriate construction material was used on the bottom portion of the building that the Facilities Director, Mr. Hughes, would like to clad with siding. The interior of the building, however, looks nearly new and almost loved. The praise stops dead at the mini-gym facilities at TRHS. So much rancid clothes littered the change room that the smell was like thrusting your nose into an old runner. Fetid clothes were balled up in lockers with doors open, some hanging nearly off. One expensive football helmet was on the floor. Another, abandoned on a bench. A faucet leaked freely. A few walls appeared to barely remember a coat of paint. If the point of this demonstration of student irresponsibility and institutional neglect was to impress on the tour members the urgency of a new gym, it did not have the desired effect on me. Yes, the facilities are inadequate, but they are made worse by neglect. Taxpayers are not blind to this ploy which needlessly pits parents against those who would like a rest from ever-increasing school budgets in a time when those lucky enough to be employed are squeezed by frozen wages and escalating costs. During the 2011-2012 year, Mr. LaSalle believed the mini-gym’s wall to be structurally unsound. At a facilities meeting two days before the public tour, Mr. Hughes reported that the wall was found to be sound after an infrared examination. Moisture penetration is a problem with the cinder block walls, but this, it is believed, can be addressed with exterior cladding. You’ll recall that voters were asked to approve a $5 million bond to renovate the mini-gym. At the last deliberative, I asked Mr, LaSalle if $5 million would be all the project would require. He replied that a few bonds of a similar size would be needed to fully integrate the changes into the building as it was transitioned into a middle school. All this over and above the price tag for a new high school. The voters wisely defeated the beginning of that slippery slope. Now is the time for us to live within our means and to do more with what we have. If investment is required, it should have a sound connection to skills needed by employers and higher education. As desirable as a new gym would be, it will not get students into productive careers. In my opinion, we need to get our academic house back on track and out of “School in Need of Improvement.” Once that is accomplished, we can then look for a more modest and more creative solution to the mini-gym. Maybe we can even save for it rather than indebting ourselves. The next facilities tour will be on September 18, 6 p.m. starting at Atkinson Academy and ending at Pollard School. These are open to the public. Dr. Metzler will likely be in attendance as he was on September 13. It is a good opportunity to meet and welcome our most approachable new superintendent — and the folks you’ve been dying to meet for years…. members of the Budget Committee. CLARIFICATION: On re-reading my post, I want to make clear that the smell and the clothes were in the change area of the mini-gym , not in the mini-gym itself. Dr. Metzler’s contract is a much more reasonable agreement for taxpayers than that struck with Mr. LaSalle and for that we can be relieved. For parents and students, however, it is still lacking. Per HN RSA 194-C:4, The Superintendent agrees to administer and supervise the schools of School Administrative Unit 55 in accordance with the laws of the Sate of New Hampshire and in accordance with the rules and regulations of the State Board of Education, of the Administrative Unit, and of the Timberlane and Hampstead School Boards within the School Administrative Unit. 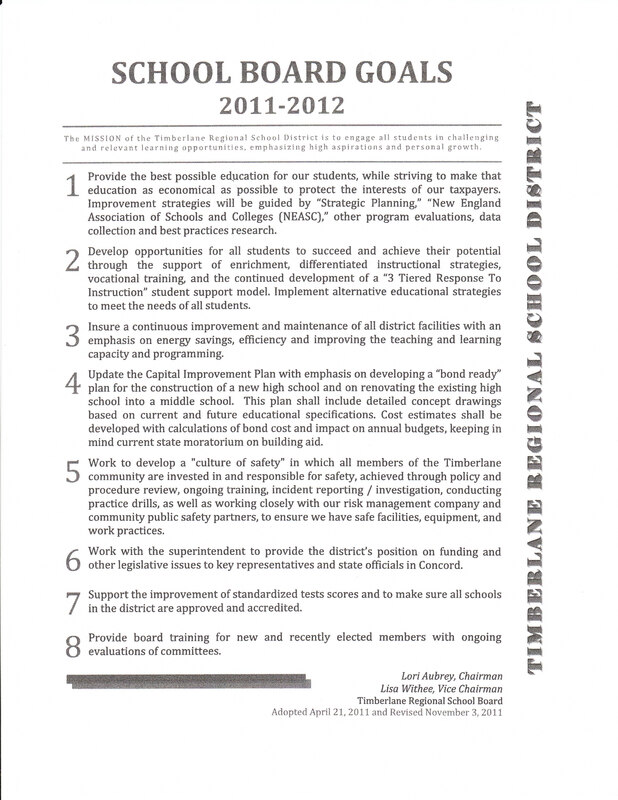 As stipulated in the New Hampshire Code of Administrative Rules, the Superintendent shall serve as the executive officer of the local school districts within the School Administrative Unit and shall be responsible for planning and administering the activities of the local school districts within the School Administrative Unit subject to statutory requirements, the NH Code of Administrative Rules and the policies and procedures of the local district. The Superintendent shall be responsible for the nomination of professional staff as required by law and the hiring, placement, and transfer of all school district and SAU personnel. See the part about being responsible for establishing high academic standards and improving academic performance? Don’t bother reading it again. It isn’t there. The SAU Board shall annually determine a set of quantifiable goals for the Superintendent. Based on the Superintendent’s success in achieving these goals, the Superintendent shall be eligible to receive up to a 4% bonus annually. The SAU Board shall have sole discretion in determining how much, if any, of the 4% bonus is payable. Any bonus is payable as of July 1. That, dear readers, is the carrot. As well all know, carrots work best when they are dangled off long sticks. This contract is totally bereft of a measuring stick. Student performance data, budget goals, facilities management, long-range planning and parent/teacher communication would be notches on my measuring stick. Although Dr. Metzler seems both eager and capable, it seems unfair even to my stern mind to impose ambitious goals to which he did not initially agree. Only the most modest quantifiable goals can be fairly imposed when the SAU Board gets around to drafting them. The board has squandered a critical opportunity that may not present itself again for a very long time. They’ve done this in two ways. First, by failing to set high expectations when they had the chance; second, by rolling out a three-year contract that automatically renews in three-year terms. As I’ve said before, three years is an eternity in the life of a young student. A one-year contract with annual renewals is categorically in the best interests of students as this protects them from administrative under achievers. Arguments were made that talent would not move for less than a three-year contract. I’m willing to bet my burial plot that it wasn’t even offered, not with an aged former superintendent as the board’s consultant. Dr. Metzler may turn out to be everything we could wish for, but prudent boards hope for the best while preparing for the worst. There is a distant saving grace. Before the end of the three-year contract, with a minimum of 180 days notice, a new contract can be offered. It’s logically possible that contract could be a one-year term, just as it is logically possible that carrots could seed themselves in a perfectly straight line. A maximum of ten unused vacation days can roll over into the next year. The previous contract allowed 60 days accumulated paid vacation. No reimbursement for unused sick leave. 90% paid health insurance vs. 100% previously. No lifetime benefits. 75% paid dental insurance vs. 100% previously. Maximum matching $10,000 per year retirement benefits. Taxpayers contributed 15% into Mr. LaSalle’s retirement accounts every year. One malingering provision does disappoint. Dr. Metzler’s contract permits him to engage in consulting and other professional activities in addition to his employment so long as they are not in conflict with his responsibilities and have been approved by the SAU Board. Being superintendent of one of the state’s largest SAUs is a full-time job. The board is only inviting trouble with this provision. I’ll have more on this later when I write about the siren lure of SERESC and NESDEC for superintendents current and retired. In the meantime, we have an enthusiastic, committed and promising new superintendent. Welcome, Dr. Metzler. May your performance always exceed the SAU Board’s expectations. I’ll admit it. I was snookered. The SAU board’s agenda for August 30th misled me into thinking the meeting to “finalize” the contract would resemble an intelligent discussion/debate of contract terms. It was, in fact, a rubber stamping of a contract finalized before the meeting, with two minor changes. Maybe you won’t be surprised to know that there was not a single public meeting at which any of the terms being offered were discussed, except when “multi-year contract with competitive salary” was decided for advertising purposes. Every aspect of this contract was cooked up beyond the eyes of the press or any interested citizens. Had all of our minds been engaged, board and public alike, we might have achieved a superintendent’s contract that rings with our highest priority — improving student achievement. Instead we have a contract without any stated performance goals. These are to be determined. (Horse leave the barn, ya think?) In fairness, the new contract is free of the most egregious terms in Mr. LaSalle’s gilded agreement, and does represent some good work by a few board members, but far from what should be expected by parents and taxpayers. While I’m at it, let’s talk about the risible conceit the boards have cleverly devised of permitting public comment BEFORE an agenda topic is addressed by the board. Even elected officials pretending to be open-minded invite debate and discussion for the insight it might engender. No member of the public is going to comment on a topic in ignorance of how the board is going to approach a matter. The Timberlane School Board and the SAU board are simply pretending to welcome public comment by requiring it before a comment is even possible. I am calling upon each member of the Timberlane and SAU boards to immediately change their public comment policy to invite public comment after board discussion but before a vote. The only thing approved faster than the superintendent’s contract on August 30th, was the hiring of a new biology teacher. Her name and her most recent employment were read, then she was voted in. Presto! Just add water and you’ve got quality education. Yes siree. Given TRHS’ dismal science scores, I would have thought, and forgive me again for my naiveté, a little more interest in a new teacher’s track record would have been in order. I don’t know this teacher or her record and my comments are not directed towards her in any way. The board may feel it isn’t their job to second guess personnel recommendations, but they are wrong and once again demonstrate their unwillingness to assert leadership over the administrative workings of the district. Sad to say but voters get what they deserve. Stay away from board meetings and your boards will continue behaving like this – hatching momentous contracts in secret, hiring important teachers on trust, and doing their very best to thwart public comment. Next – The new contract: You could pass an entire cohort through what’s missing.